The craddle where your child is always placed should be safe and secure. They are meant to keep the children from harm and other unwanted incidents. So, the DaVinci Kalani 4-in-1 Convertible Baby Crib is just the right place where you would want your child to stay. As your kid grows up, you would want the craddle to still contain him up to a specific time. The Kalani is a durable cot for your kids because it is made from New Zealand Pine wood. With non-toxic finish, this piece of furniture is a haven for little kids. The wood was obtained from sustainable forests. This follows the family values of the DaVinci family of environmental sustainability and energy efficiency. Aside from that, they also ship the items in the same way: energy-efficient. They aim to reduce our carbon footprint and stay true to their core values. 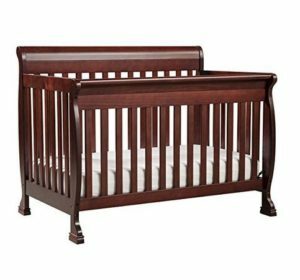 This durable DaVinci Baby bed model M5501 is of heirloom quality. Your kids might grow in and grow out of it. You can have your next child still use it. If you are careful, you can even hand it down to your kids for their children. The cradle can be converted to a bed with head and footboard. There are railings that are sold separately for this purpose so make sure you got those too. It has mattress springs instead of those slats that can be quite annoying to adjust or MDF panels that tend to slide. There are four height adjustments so you can find the right setting for your stature and not find it difficult to set down your child in his crib. The front panel is not movable or foldable. This is a significant advantage so that there would be no joints that can pinch little fingers. The toddler rail is included so you can easily attach it. Assembly and dis-assembly are pretty easy as well. Just read through the instructions so that putting together your Kalani Convertible Baby Crib will be a breeze. This is an excellent piece of furniture that will keep your child safe. With the great color finishes, it will match your other furniture in the baby room and will surely last a long time. While baby management itself is a tedious task, having them put to sleep comfortably is even more so. DaVinci Kalani 4-in-1 Crib eliminates that problem by providing a heavenly environment for a child’s precious slumber. Customers have loved this product due to its adjustable height, sturdy structure, weighted balance, and pleasing look. The inclusion of the toddler rail is hugely helpful, as well as mattress springs, which provides both comfort and safety. The foaming, seating and the cot itself can be fixed at various angles. Best of all, the entire system can be converted to be a different form of a bed, especially a sleigh bed with footboards. The finished coloring though is not as strong as it should be. The furnished look disappears quickly and is prone to scratches and cuts. As babies are known to bite or claw surfaces around them, this is a discouraging feature.